I am considering buying shares in a cow! My love for whole milk, cream and cheese are far too great to insult by buying conventional or even CO dairy products. Un-pasteurized whole milk is said to taste worlds away from it's distant cousin, I can only imagine. I've heard people talk about it, but never with any nouns. They speak of it bigger than that; with pivotal remarks like, "what life was like before raw milk," and then, "what life has been like ever since." Okay, okay, I may be instilling you readers with a notion of flighty, airy-fairy hippy-likes, pontificating from behind a milk moustache, but seriously, these opinions stem from old Swedish men who feign raw milk as being a life giving, immune system enriching nectar. Who am I to dispute 70 years of experience? Despite much of the anti-milk news we've read about in health and nutrition journals in the last 10 years, raw milk is making a comeback. Partially I'm sure because in Canada, at present, there is a war going on with regard to the production and dispersal of it. The bottom line with raw milk is this: There is no doubt that fresh milk is more nutritious and bio-available than conventional product. The mere act of cooking the calcium mineral, well, calcifies it. The body can do nothing with it at this point. Not to mention the rich, live enzymes & amino acids present in fresh milk that assist with its digestion, or, the micro-organisms which provide us with the antibodies to ward off real bugs. Raw milk IS an immune enhancing whole food. In my research, I have come across this informative website, so that you, Reader, may draw your own conclusions about this hot topic. 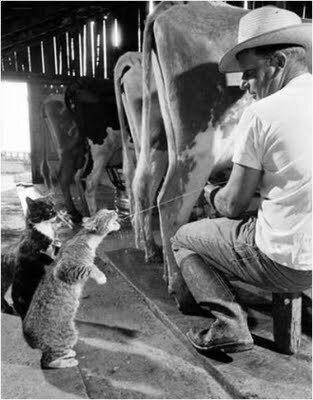 In any case, this Tuesday, I will be sampling for the very first time, unpasteurized, fresh milk. I think I'll be a very happy kitty, indeed! Amanda I have fond memories of fresh (unpasteurized)milk and cream from my friend's farm as a kid. I still dream of that cream! Anxious to hear how your tasting went!